"Treat yourself to an exciting array of Indian delicacies." Hotel Roopa strives to take you on a culinary journey to enjoy the finest quality of food stylishly prepared and served with elan. 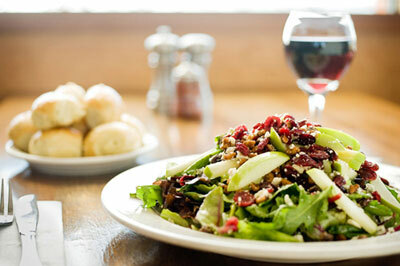 Food and Beverages is a Gastronomic creativity as well as a culinary art. Cuisines are many but the taste is of Rare Deliciousness. The Allurements of a Banquet spread provides a festive mood every time you wish to indulge yourselves in any of engaging outlets. 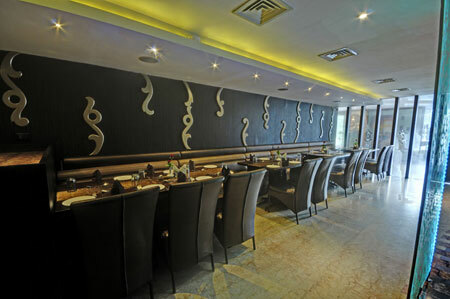 Spicez Fusion is a Lobby level Multi Cuisine Restaurant with a dynamic concept in dining. It will be the talk of the town in the coming days for its consummate ambience and the soothing lights which itself is a colour therapy to make the guest feel relaxed and rejuvenated. The walls of the Restaurant have modern evocation motifs and accented with brushed golden patina. Aesthetically designed menus that will delight the connoisseur and the ambience will revitalize and refresh the guests. Your Passport to the World’s choicest cuisine - Spicez fusion offers more than just authentic global food, whatever the occasion or your palate; it will not stop tickling your taste buds, tempt your appetite with melt-in-your-mouth appetizers and steamy starters to truly tempting desserts that satisfies anybody craving, leaving you wanting more. Indulge your gastronomic desires with a plethora of flavorsome sensations, including the Italian Gelato, Mexican Tacos, the Greek Mousaka, the yummy Thai noodles, or Spanish pasta and many more phenomenal cuisine ideas…. we have it all. Great food from around the globe served in an exquisite ambience with the magic of soulful music in a friendly atmosphere. 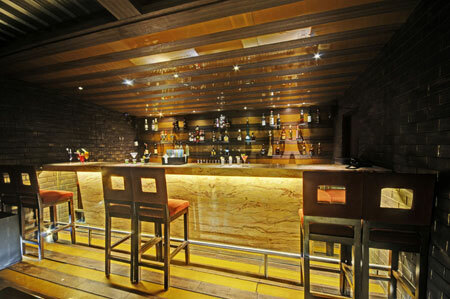 Attached to Spicez Fusion is the softly lit small relaxed bar invites you to romantic ambience. Offering an extensive Mocktail and Cocktails, including Martinis, Mojitos and frozen Daiquiris it accommodates 16 party …. Exclusively designed interiors with changing mood lights will amass you into another world. Spicez Fusion will make the dining experience an evening to remember. You are guaranteed a warm welcome and friendly service at Spicez fusion every day of the year only in Mysore at Hotel Roopa. Spicez Fusion has many ideas at an exceptional location for your Corporate Parties, Business Meetings, Wedding Ceremony & Receptions, Rehearsal Dinners, Special Occasions, and Holiday Parties at a unique site. Dine, drink and celebrate at Mysore’s premier Lounge Bar & Fine Dining known for its interiors and an all day fine dining amidst greenery with a picture perfect view of Mysore Palace, Chamundi Hills, and St. Philemono’s Church. Ranked #4th best Restaurant in Mysore by Trip Advisor based on the reviews of both domestic and foreign travellers. Infinit is an experience that has been designed with great care and an eye towards perfection. Located in the happening environs of B.N Road, its presence here has rendered a special meaning to "Hotel Roopa". When you enter Infinit, scintillating interiors will meet your eyes. They are famous for their classic cocktails and mocktails, have a well stocked bar and a fine collection of wines to ensure an agreeable evening for you beside excellent menus gathered from all around the world. Infinit offers an attractive setting for any style of gatherings with its restobar and open air garden. Special family get-togethers, friendly re-unions and after work cocktail parties can now find an ideal venue at Infinit Lounge Bar & Fine Dining. The corporate events like product launches and team celebrations have also made it as the Venue in the tasteful ambience of Infinit. It’s the most happening place in Mysore as every time you’ll find them doing promotions or events in an innovative way. Be it the “Live Counter” serving hot delicacies or the “Live Grills” – a tailor made Portable Grill exclusive for a table etc are its USP’s and are made in true style. You’ll be in for surprise every time you walk-in. You may win an “Infinit Privilege Card” on dining wherein you’ll get 20% Discount for the whole year on Food & Beverages and also for the Rooms. Experience the hospitality and spend some good time to have it in memoirs forever.